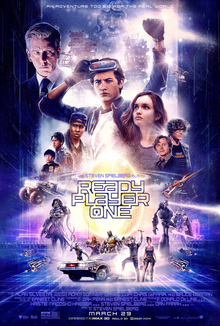 Ready Player One (2018) is a rare film for me, mostly because I had read the book well before the movie came out. In fact, I read the book shortly after it was released, and was impressed by the sheer volume of pop culture references. Consequently, I figured such a film could never be made. Just based on the incredible amount of coordination it would take to get rights approvals from so many different places, the legal side of such a film would be a nightmare. If it was made into a film, I imagined it would certainly be a fun and flashy romp through cyberspace. The film version, while not entirely faithful to its source material, certainly lives up to my imagination. While the book spends paragraphs describing all the pop culture references, the movie does it one better and gives quick, flashing glances of something that fans of pop culture will immediately recognize, or at least be able to pause and scrutinize in the home video release. These subtle nods never distracted from the story since they were mainly visual references. Spielberg, in a return to form that hearkens back to his family films from the 1980’s, managed to find the right balance here and allows us to revel in gooey nostalgia while also reminding us that the virtual and real worlds are distinctly different realms—a good reminder for all of us. In fact, some rude internet behavior was my only qualm with the film, even if it is somewhat accurate of the internet culture. Regarding the plot discrepancies, I feel the movie helped to smooth out some of the rough edges from the book. The novel had a lot of intriguing ideas, but they seemed slightly disjointed. The movie, however, manages to create a more cohesive narrative from some of the basic building blocks of the book. In much the same way that The Shining (1980) was a distinct and artistically significant work separate from—and linked to—the book it used as its source, Ready Player One (2018) uses its source material to create an equally significant work to its origins. A fun and polished love letter to popular culture and the internet, I give Ready Player One 4.5 stars out of 5.